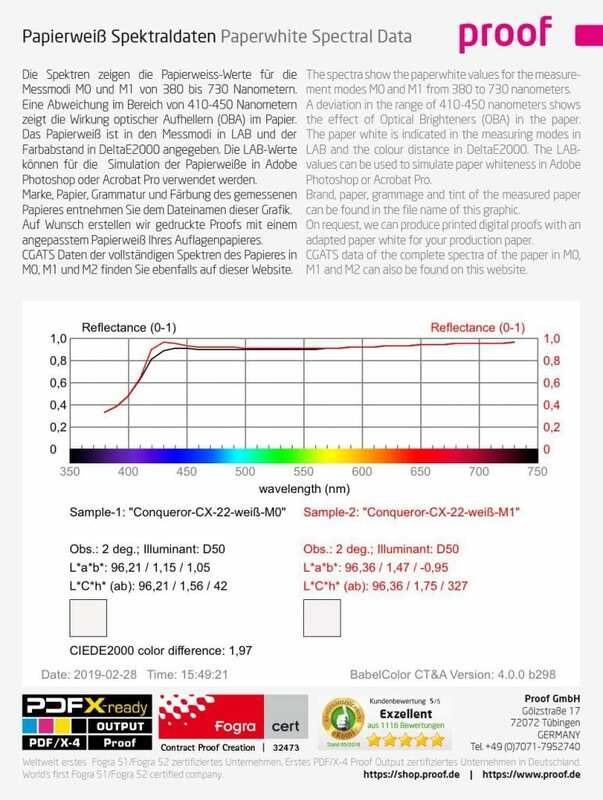 We spectrally measured the paper white tone and the proportion of optical brighteners of over 1,000 papers of the most important paper manufacturers such as Berberich and Papier Union as well as online printing companies such as Flyeralarm and wir-machen-druck.de. 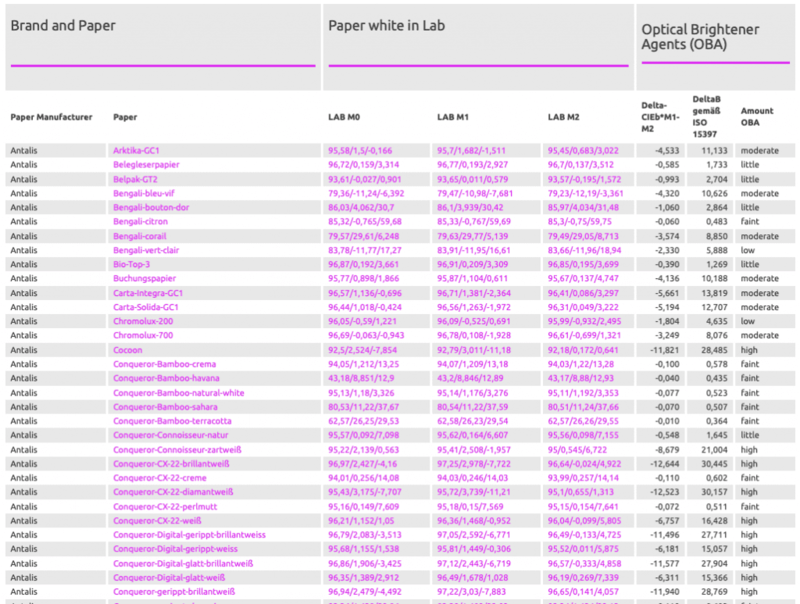 Only a few paper manufacturers currently publish data on paper whiteness and the proportion of optical brighteners in their papers, but only technical indicators such as whiteness according to ISO 2470-2 or CIE ISO 11475. However, designers can hardly record paper whiteness with these values. In addition, it is not possible to read from these data whether and what proportion of optical brighteners the paper has. 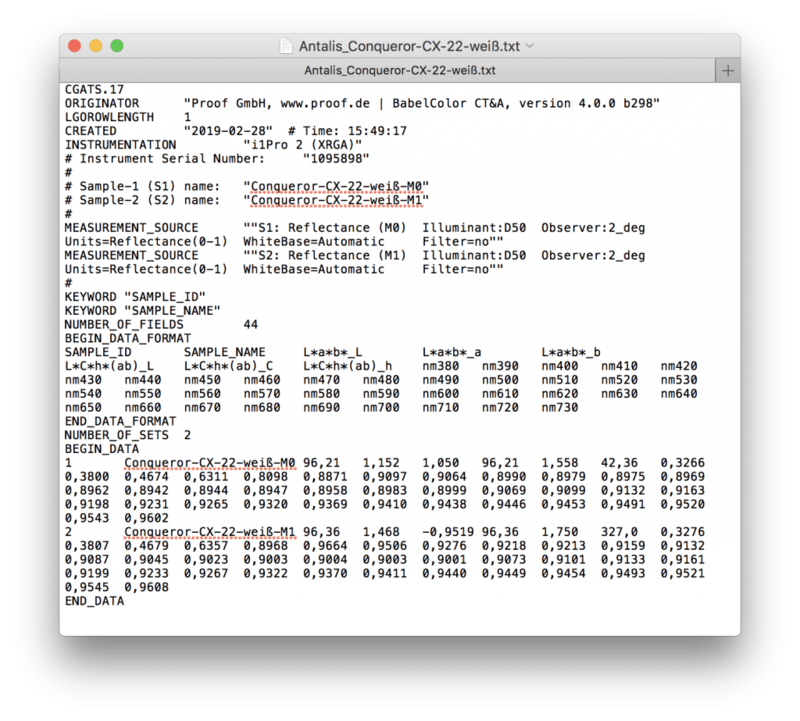 Example above: Spectral data comparison of Antalis Coqueror CX 22 white for the measurement standards M0 and M1. Below you can also see the color deviation in Delta-E00 of 1.97 and the two paper white values in LAB and LCH. We have therefore measured the most important papers and dyes of all central paper producers and paper distributors as well as online printers in the three measurement standards M0, M1 and M2. From the difference in the paper whiteness of the two measurements M2 (UV cut without UV portion) and M1 (ISO 3664:2009 with noticeable UV portion), we determined the color distance on the yellow-blue axis of LAB in Delta-b and derived from this the proportion of optical brighteners according to Delta-B according to ISO 15397 and evaluated it. Parallel to the images of the spectra, we have also provided spectral data in CGATS format for the measurement modes M0, M1 and M2, which can be downloaded for any paper. These values can be used, for example, in proofing software to calculate a paper white simulation for a specific production paper.